Variegated hand-dyed yarns and fibers are some of my favorite choices when starting a new project, but sometimes those colorful braids and skeins can be a challenge to work with. 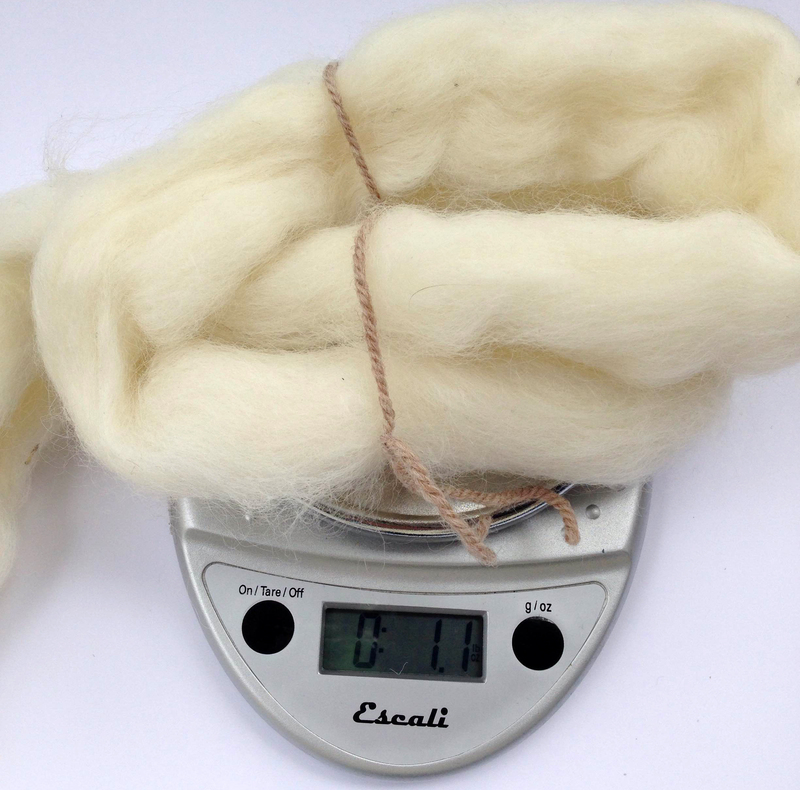 Especially when it comes to spinning fiber, it can be hard to control where the colors fall as you spin. One fun solution to this problem is to choose a fiber with longer color sections: they can either be a series of differing colors, which would produce a stripe sequence when spun directly from the braid, or a range of tonal values in the same hue, which would produce a gradient effect as you spin. 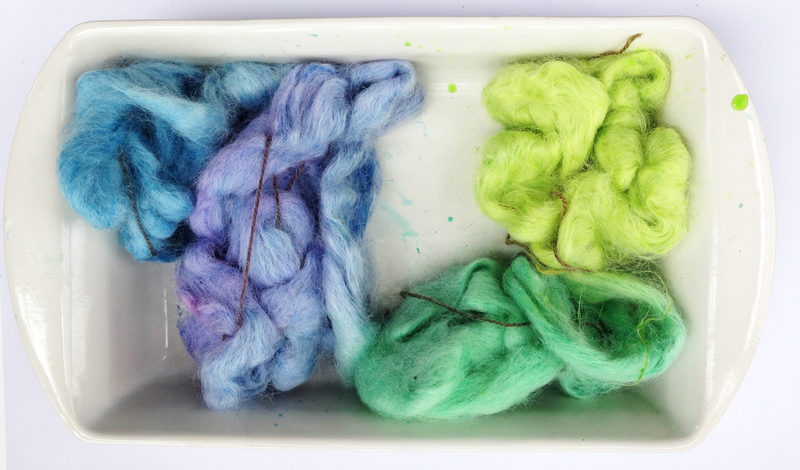 In today's post, I'll show you how to easily dye prepared fiber to achieve long color repeats and gradient effects with as little mess and fuss as possible, allowing you to spin directly from the top to create your yarn. Ready to get started? You'll just need some basic supplies which you probably already have on hand. For today's post, I used Easter egg dyes because they are user-friendly and non-toxic; if you don't have a stash of Easter egg dye from this past spring as I do, feel free to use kool-aid, food coloring, natural or conventional dyes instead! 1. 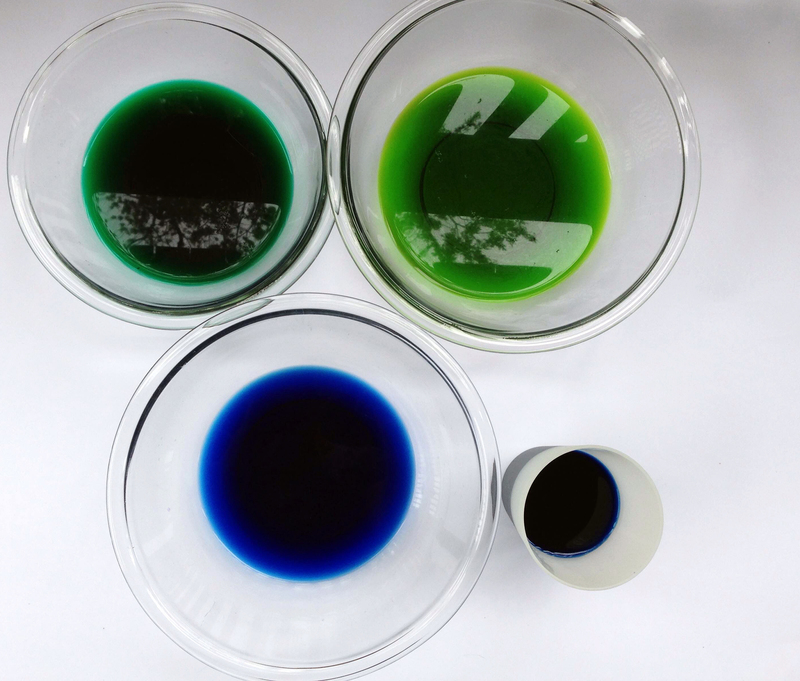 Prep the dye: Click here to read how I prepare to work with Easter egg dye. You can also check out this blog post from the Woolery blog archives for more at-home dyeing instructions. 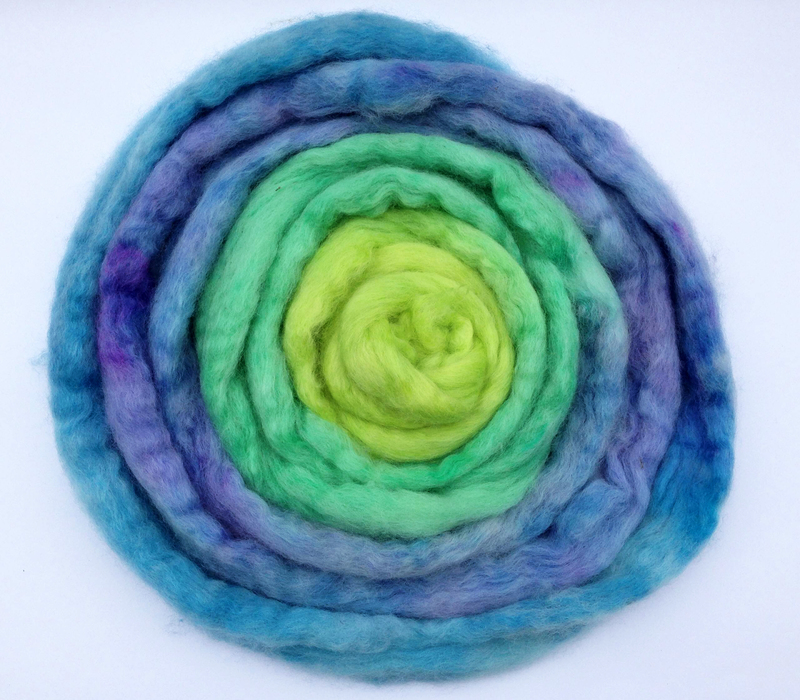 Pro Tip: I recommend mixing more dye than you think you'll need - spinning fiber can be rather thirsty! It's probably easiest to arrange your dyes in a straight line in the order you'd like the colors to appear, but I was short on space, so I arranged my dyes as you see above and worked clockwise from the bottom right. 2. Prep the fiber: Usually, I like to soak the yarn or fiber I'm about to dye in lukewarm water with a little vinegar added; however, I thought it would be easier to work with unsoaked fiber this time around. Honestly, both options would produce wonderful results, it just comes down to a matter of preference. Since I was planning to make four large color repeats on the 8oz of undyed Louet Jacob Sliver, I loosely bundled the sliver into four somewhat equal sections by weight. To secure each section, I used scrap yarn to wrap around the sliver, which I wound around my hand to make distinct sections. Just be sure to leave enough fiber between sections so that you can fit each section in its dye bath without pulling apart the fiber. Also, don't tie the strings too tightly, or you will have undyed sections on your fiber where the dye wasn't able to reach. 3. Time to Dye! 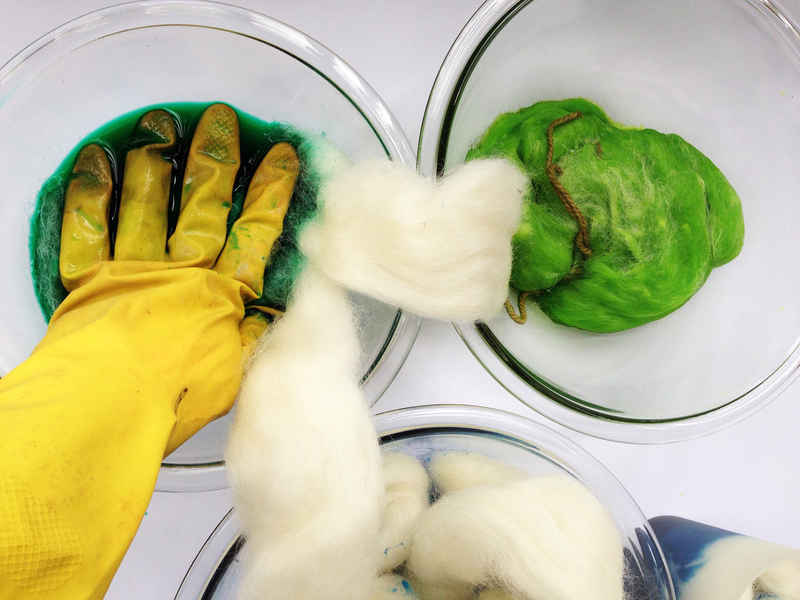 Beginning with one end of the fiber and your first color, submerge the bundled section in the dye bath. 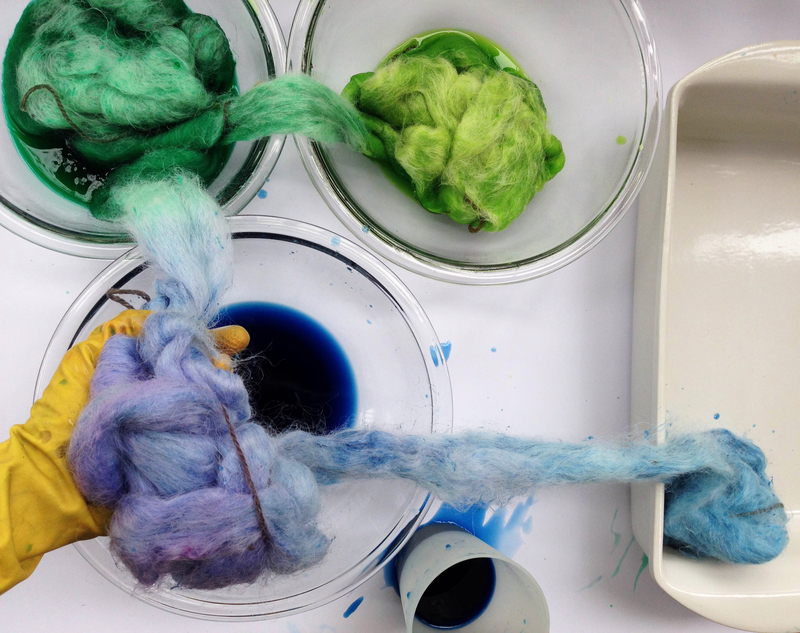 Add the next bundle of fiber to the following dye bath, and so on, until all of your bundles are submerged in their own dye bath. Work the dye through each section by squeezing it gently. 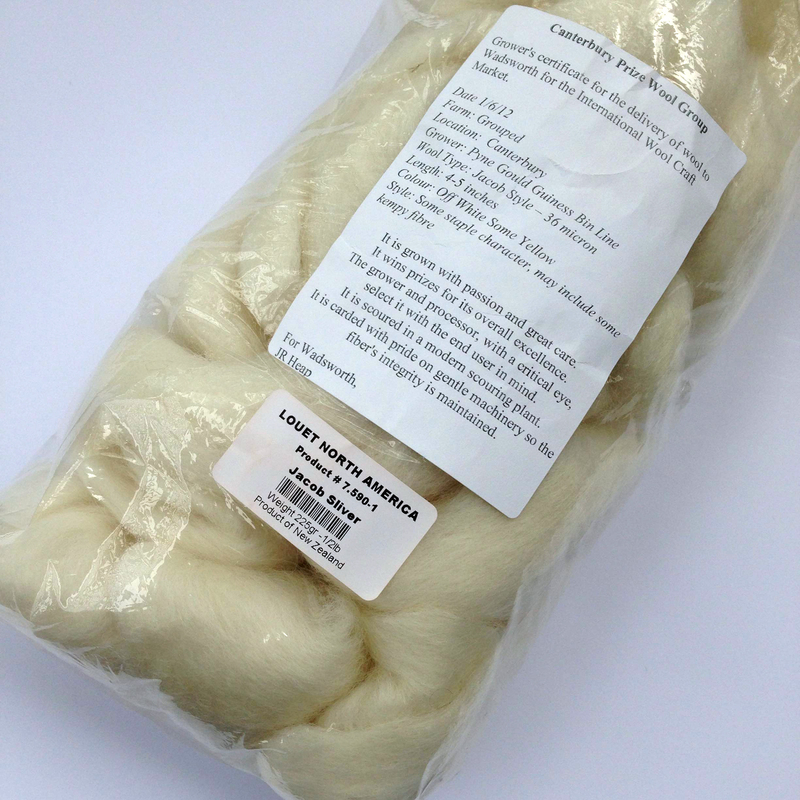 Some of the spinning fiber will still be undyed between each of the color sections; you can either let it sit for a few hours to let the dyes naturally creep up the fiber, or you can use your hands to work the dye through these sections as well. 4. Transfer the Fiber to a Glass Dish: Once you have worked all of the dye through the fiber, you will need to transfer it to a microwave-safe or oven-safe dish (depending on how you plan to set the dye, which we'll cover in the next section). To do so, you will need to start with one end of your fiber and gently squeeze out all of the excess dye BEFORE transferring it to one end of the dish. Repeat this process, carefully arranging each of the bundles so that they don't bleed into the next section. 5. Set the Dye: Many folks use the microwave to set the dye, but I prefer using the oven when I dye. A few minutes before I started dyeing, I preheated the oven to 275 degrees F. By the time I was finished with step 4 above, the oven was ready. I put the baking dish of fiber in the oven and set the time for 10 minutes; once it went off, I pulled out the dish and carefully turned over each bundle of fiber, then put the dish back in the over to heat for another 10 minutes. Depending on your oven, you may need a little more time - I usually go by whether or not the dye has exhausted by squeezing a small section of fiber to see if dye or clear water comes out. If no dye is released, then it has been exhausted and doesn't need any more heat! 5. Time to dry: Once it's cool enough to handle, gently remove the fiber and squeeze out any excess liquid over the sink. Find a good place to hang it up to dry where it will be away from sunlight, curious pets or children. 6. Time to spin: Now it's time for the fun part! I plan to split this 8 oz sliver down the middle so that I can spin two matching singles in the same sequence of colors. 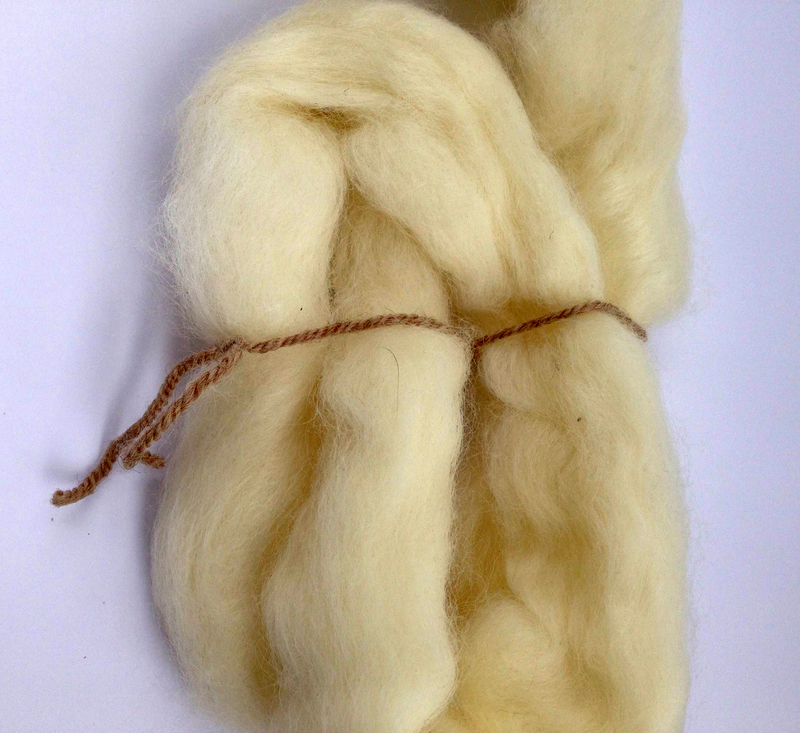 It could also make an interesting single or chain-plied yarn spun directly from the sliver as-is. The possibilities are endless! For any non-spinners out there, these instructions will also work for dyeing skeined yarn or yarn blanks to achieve similar results; I've even seen instructions for dyeing caked yarn in a similar manner! Like anything, there are many, many different approaches to dyeing yarns and fibers in general, as well as to achieve long color repeats and gradients - this is just one way to explore the world of at-home dyeing, and I encourage you to experiment and try other techniques to see which works best for you! 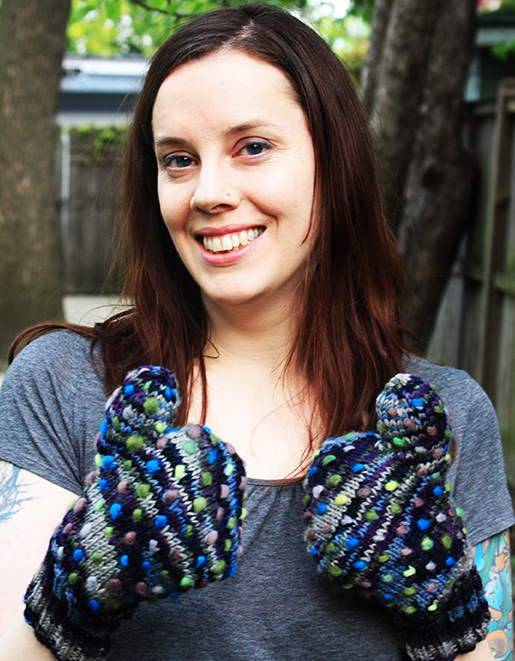 Stefanie Goodwin-Ritter is a blogger, knitter, crocheter, spinner, and all-around crafting enthusiast who calls Chicago home. 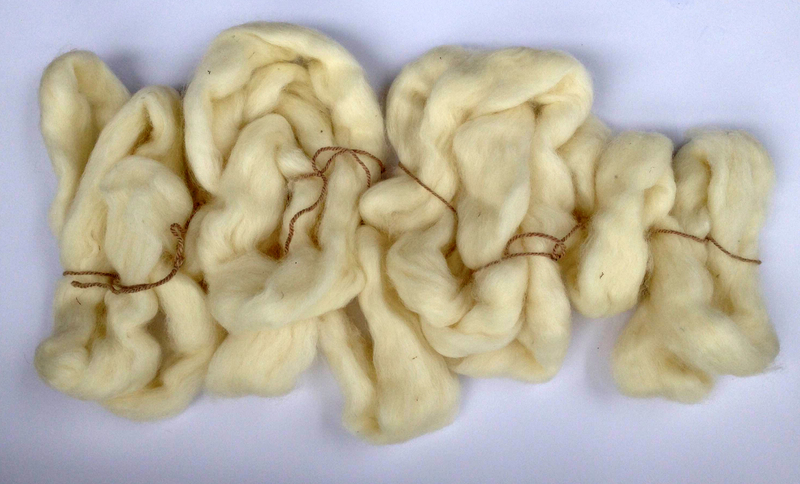 She used to be a dyer at Lorna's Laces Yarns, but now experiments with hand-dyeing yarn and fiber at home just for fun! You can follow her fibery exploits at handmadebystefanie.blogspot.com.